Most mopeds do not have a battery, so the electricity is all AC alternating current. Some mopeds and almost all motorcycles have a battery, usually 12 volt. Their electricity can be all DC or part DC and part AC. An incandescent light bulb works the same on AC or DC, but a horn is made for either AC or DC. DC current horns go beeeeeeeep, like a little cute car horn. AC horns sound like the buzzer when you get a wrong answer on a TV game show. AC horns also sound like duck callers. The pitch goes up with the rpm of the engine. They’re not much louder than the engine. It is difficult to sell used or new old stock AC horns that were made 35 years ago. If they haven’t been kept in a sealed wrapper, then they might not work good, even though they’re new. It’s because corrosion can get on the aluminum plate. Furthermore, you cannot easily tell whether a horn is good or bad. You cannot easily look inside because it is riveted together. You cannot perform a valid test of it unless you have the moped it is intended to go on, running, with working horn wires and button. Because the AC an vary from one kind to another, and from a new one to an old one of the same kind, you never know if a horn that works on a Peugeot for example, would work on a Puch, until you try it. Or it might work good on Puch at low rpm, but not high. Maybe visa versa on Garelli. It also matters whether the head light is off or on. Many AC horns will not work, or are not loud, unless the headlight is off. Myrons Mopeds has some 6V AC horns, but they are only offered when the running good moped is present in the shop and able to easily attach the horn to test it. The price is usually $20-25 for a good used AC horn. 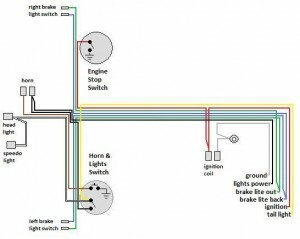 All modern scooters and motorcycles have 12 volt DC horns. They are common. Some older Taiwanese mopeds have 6 volt DC horns. AC buzzers are “old school” and are not on anything modern. So there are no known freshly made replacements. ZADI was founded in 1962 by Antonio Zavatti and Enrico Diacci, two former employees of Magneti Marelli. ZADI made all of Piaggio’s locks, and most 1960’s and later Italian motorcycle locks. In the 1997 ZADI purchased GKS (formerly Neiman, maker of fork locks) and other companies, forming ZADIGROUP. In 2001, ZADI purchased the electrical giant CEV, and has since become a world leader in manufacturing motorcycle and vehicle lock sets, lights, instruments, odometers, switches and electronic solutions, such as automatic parking systems. Aprilia (Italy) made lights and switches for many 1960’s – 70’s Italian, and some non-Italian, motorcycles and mopeds. This greyhound logo appeared on a 1972 Ducati 750GT head light. This Aprilia, an electrical equipment maker, is possibly from the industrial town of Aprilia, near Rome. The famous Aprilia motorcycle make is completely different. Merit W erke (Germany) made switches for German mopeds, and for Puch, Peugeot, and others. Merit Werke Gmbh began in 1966, in Germany then later moved to Malta, in the Mediterranean. They still make automotive switches and components, with the same MW logo, but with the name Merit Malta. ULO (Germany) made tail lights, reflectors, and turn signals for German mopeds, Hercules (Sachs), Kreidler, Solo, Kynast, and tail lights for many non-German mopeds, Batavus, Sparta, Puch, Peugeot, Motobecane and Honda PA50. ULO was founded by Moritz Ullman in 1947 in Geislingen Germany. Ullman knew how to make molded glass products, like bicycle reflectors. Luxor (France) made head lights for French mopeds, Peugeot and Motobecane. Luxor has been making quality bicycle lights for about a century. 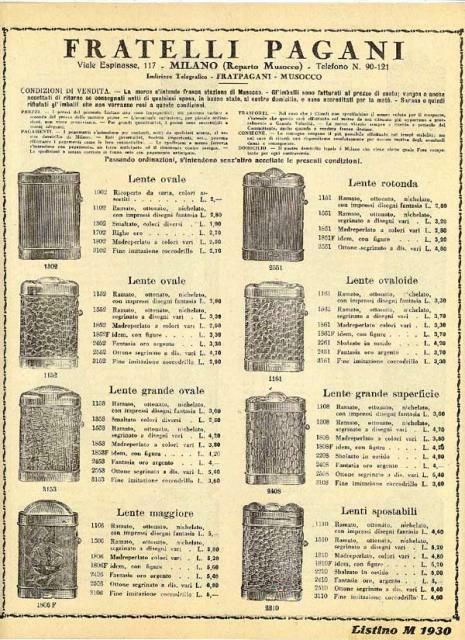 Before electric lamps were “invented” in the 1910’s, Luxor made carbide lamps. In Europe the Luxor Motobecane head light is square. USA-model Motobecanes have a 4.5″ round sealed beam housed in a Luxor ring and bucket. HR (Slovenia) stands for Hidria Rotomatika, a division of Hidria. Tomos (mopeds), Iskra (moped magnetos), and AET (moped electronics) are also divisions of Hidria. Along with many automotive and industrial products, Hidria Rotomatika made high quality controls and switches for Volocci (electric) and Tomos mopeds, 1992 to 2007. The HR switches are nicknamed “blue button” in the Myrons Wiring Diagrams, because they are part of a sequence useful for identification: TOMOS SWITCHES: 1986-91 had only “black button” CEV, 1992-07 had mostly “blue button” HR, 2002-07 also had “yellow button” Domino, and 2008-13 had only “red button” TBS. The Hidria Rotomatika controls are referred to here as “1992-2007 Tomos” controls. The only HR logo is on the right switch, barely visible. The “1992-07 Tomos” controls say “TOMOS” on each black plastic lever blade, but say nothing else. Domino (Italy) is well known for making controls. Since the 1970’s in the US, and before that in Europe, Domino made controls for about 90% of all Italian mopeds, and for about 30% of all European mopeds. They are still going. In the 2000’s Domino also made switches, used on 2002-07 Tomos Revival, Arrow, Arrow-R and Streetmate. TBS (India?) makes modern motorcycle and scooter controls. Their control levers, throttle, and both switch assemblies all have awesome quality and function and resist breaking. The TBS switches are nicknamed “red horn button” in the Myrons Wiring Diagrams. TBS controls (Domino compatible) are on 2008-13 Tomos mopeds, all models. Peterson (USA) made tail lights, and head lights for 1970’s American-made mopeds, like AMF and Murray. Peterson began in 1945 making automotive tail lights. They still produce head lights, tail lights, and other automotive items in their huge Grandview, Missouri plant. 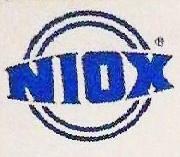 Niox (Germany) made head lights for many 1960’s German cars, such as Mercedes Benz, and motorcycles such as Zundapp and Hercules. On 1970’s US mopeds, a NIOX 4.5″ round head light in a ULO housing was original on 1978-81 Puch Magnum. NIOX square headlights were on 1984-86 Puch Maxi Sport LS, Maxi Sport LS II, Cobra, Cobra II, and Austro Daimler. ULO-housed NIOX round headlights were also on some German moped makes like Solo (Odyssey in US). Every other German, Austrian, or Dutch moped had a CEV headlight. Saturnus (Slovenia) made lamps and reflectors for European cars from the 1950’s on. They began in 1921 making tin cans. Saturnus made lights for Tomos mopeds from 1988 to 2012. Their rectangular head light and rectangular signal light assemblies are similar to and interchangeble with CEV lights, but the individual parts are not. Unlike CEV, Saturnus lights lack the US DOT certification. So most USA version Tomos mopeds have CEV lights. 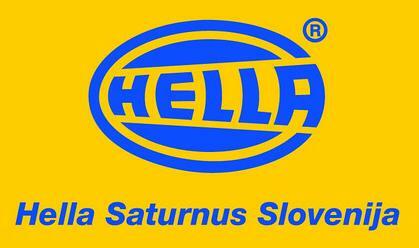 Saturnus is now part of Hella (Slovenia). 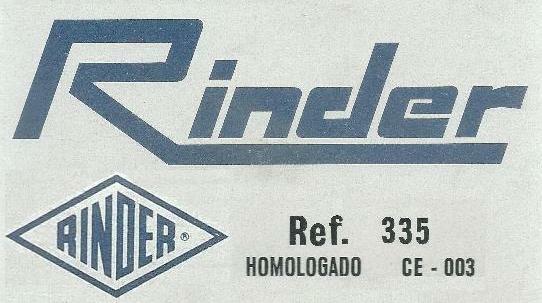 Rinder (Spain) made head lights for Derbi mopeds and motorcycles. Spain had high import taxes to encourage the use of domestic components. That’s why some Derbi parts are Spanish-made-under-license, like the Walker (VDO) speedometer and the Arbeo (Dellorto) carburetor. The Rinder square-hexagon moped head light would have been on the US models, but it did not have DOT approval. That’s why the Derbi Laguna fairing has the “incorrect” shaped CEV round head light. 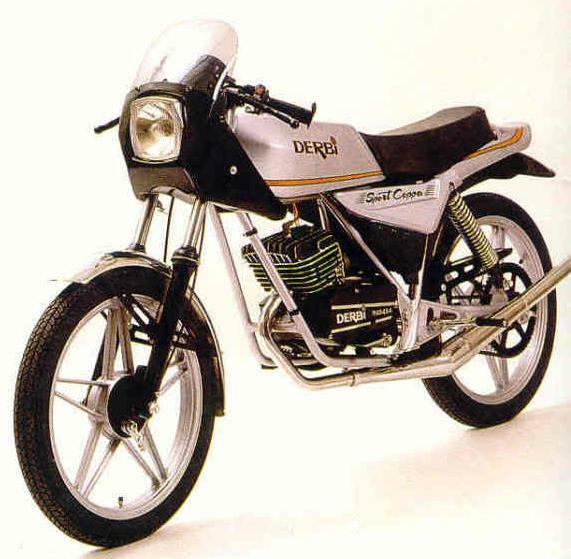 In Europe, the Sport Coppa motorcycle and the 1970’s -early 80’s Derbi Variant mopeds, all had the “correct” square-hexagon Rinder head lights. By the late 1980’s Rinder had a rounded rectangular headlight approved by US DOT, used on the Derbi Variant Sport and DS50. Stanley (Japan) made head, tail, and turn lights for vintage Hondas. Koito (Japan) made headlights. Denso (Japan) made some Honda electrics. Kokusan (Japan) made electrics. Tatung made Taiwan moped speedometers. The Czech moped, Jawa, has it’s own components. 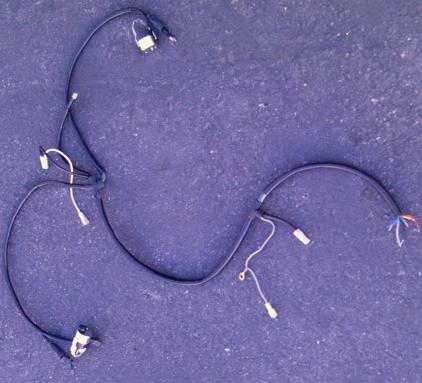 This is a main wiring harness for 3-or-more-coil moped magnetos (ignition, lights, brake light). 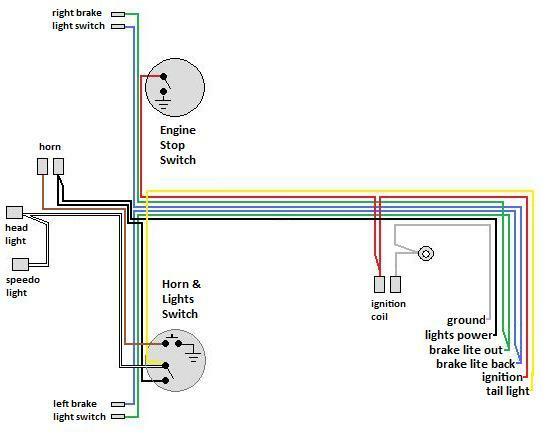 It can be configured for 2-coil magnetos (ignition/brake light, lights). See below for possible configurations. It is shown as a photo and a schematic. It comes with the round chrome switches, right for engine stop, left for headlight and horn. Price is $65. This is only the front main harness. A rear harness, engine to tail light, and connector block are needed to make a complete harness, but they’re not included.